As a young boy, Opelika Police Dept. Capt. Bobby Kilgore had aspirations of serving as both a soldier and police officer. Following his retirement on April 30 from OPD, he will have had a chance to realize his childhood dreams. Born and raised in Talladega, Kilgore enlisted in the U.S. Army after high school, spending two years each with the 101st Airborne Division and 8th Infantry Division in his one and only tour of duty. In 1988, he returned home and joined the Talladega City Police Police Department. Upon the recommendation of a close friend and former colleague at Talladega, Kilgore applied for a position with OPD, a decision he said he will never regret. “He told me how great the area and department was, so I put in an application. In June 1990, I was officially a member of OPD,” Kilgore said. Kilgore started with OPD as an entry-level uniform patrol officer, helping maintain law and order in a city that has seen abundant changes in his nearly three-decades-long career. “It wasn’t nearly as big as it is today. There was no TigerTown and so many other places around today that didn’t exist back then,” Kilgore said. Following his promotion to corporal in 2003, Kilgore assumed the role of department training supervisor position, which included training for recruits and young officer and making appearances at public functions as an OPD representative, among a litany of other duties. He also shadowed Capt. Melvin “Bubba” Harrison, OPD’s public information officer at the time, who fielded and answered questions from both the public and media. During the next 13 years, Kilgore was promoted from corporal to lieutenant and eventually captain, having experience with OPD’s detectives, traffic homicide team and PIO, the position he is now retiring from. Serving as OPD’s PIO has had its good and bad days for Kilgore the last two and a half years, but he said having a chance to interact with others and strengthen his department’s bond with the community has been extremely rewarding. “If somebody calls because they have a problem, and you’re able to help them solve that problem, you leave with them feeling better than when you got there. Just being able to help others makes us feel good about the job that we’re doing in our community,” Kilgore said. “I very much enjoy interacting with the public and the function of this position that I’ve had a chance to serve in. 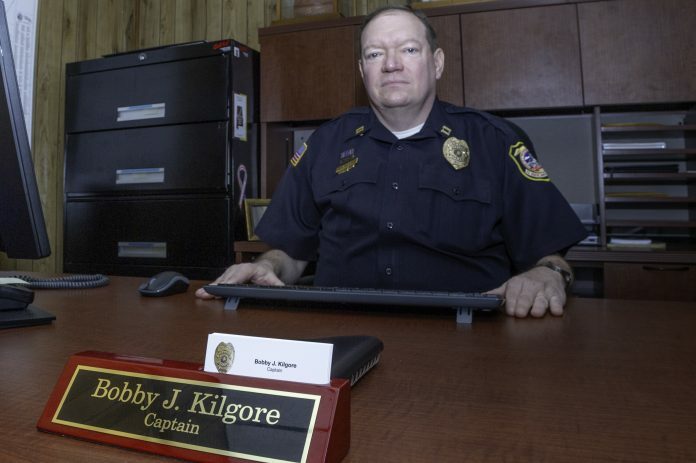 I’ve been blessed to do almost everything at this police department and for a law enforcement career that you could possibly do,” Kilgore said. Under three weeks before his last day with OPD, Kilgore said he has received floods of congratulatory emails and phone calls about his retirement, a day he is optimistically awaiting. “I don’t know how I’ll feel on April 30, but right now, there’s a great deal of excitement. I do feel like it’s my time for me to go and move on to the next chapter of my life,” Kilgore said. Kilgore said he plans to spend a good bulk of his time with his five grandchildren and being “the world’s biggest t-ball and cheerleading fan in the world.” He will also work part time at USA Town Center’s Southern Survival Military Surplus, providing instruction on proper gun safety for its shooting simulator range. No official replacement has been named for Kilgore’s position.